The Notre Dame Cathedral Paris or Notre Dame de Paris (Meaning 'Our Lady of Paris' in French) is one of the most prominent cathedrals in France and one of the oldest ones too. 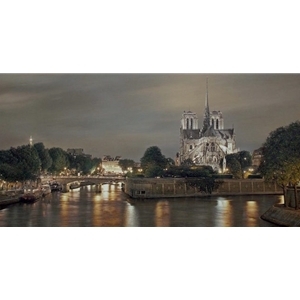 Rod photographed and sketched the cathedral from many angles, ultimately choosing this beautiful view at night. As he does in all his paintings, he removed tourists, pedestrians, and vehicles, leaving you, the viewer, to enjoy this vista in a private thoughtful moment suspended in time.